This is Fabiano Ferriera de Melo. 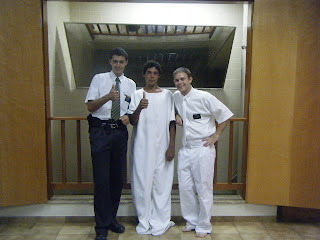 This is baptism #2 for Elder Clark, #3 really, because he and his comp each baptised someone last week. We have faith that Chris will adjust with time and pray that in the meantime, he will........ Só Batismo!! Gees, Chris! Way to hit the ground running!! How great does it feel to know you are helping add something wonderful to these people's lives? You are amazing!